Chameleons are highly creative and adaptive members of the lizard family and are most well known for their ability to change colour, either to attract a mate, scare off a predator or even blend into the background. 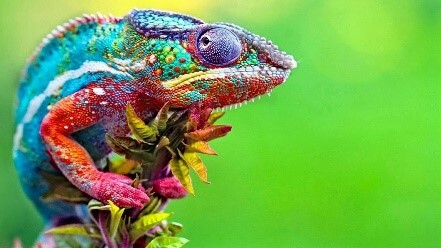 But how exactly does a Chameleon change colours? 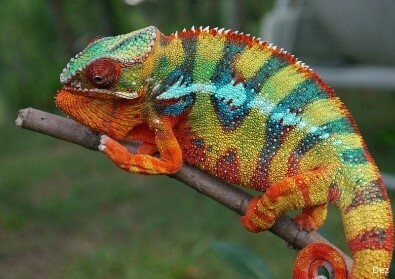 The Chameleons have a layer of pigments in their skin under which is a layer of cells with guanine crystals. It is changing the spaces between these crystals that alters the wavelength of the light reflecting off them which in turn changes the colour of the skin. Much more complex than them just thinking “I feel in a Pink mood today”. As mentioned earlier one of the reasons for changing colour is camouflage but researchers also believe that changes in colour can be for social reasons as a means of communication and also a reaction to temperature and other environmental conditions. Famous for their long tongue that is highly adapted to catching prey, their tongue can actually be up to twice as long as their body. It is densely curled up in a tight ball in their mouths. Chameleons unlike most animal continue to grow their entire lives. A Chameleons foot is rather like a human’s hand with an opposable digit which allows them to grasp onto tree branches. Males are more come distinctively coloured than females. Their eyes have a 360-degree view and move independently of each other and they can see a wider range of light than we can. They can in fact see both visible and ultraviolet light. Chameleons have become a popular exotic pet in some countries and although they are not difficult to look after they do need a lot of specialised care and should be looked after by an experienced reptile owner or better still left to enjoy their natural habitat. Cheltenham. Not quite the Capital of the Cotswolds.